since i’ve started playing chess, i’ve become tres successful at doing the seating plans for my dinner parties. it’s elementary. all one has to do is to identify the pieces. my friend R, for example, pedantic and judgmental always sideways with his approaches and cleverly ambiguous with his comments. clearly a bishop. on the otherhand, ms O being the octogenarian decorator, wise, bitter and well travelled aka white queen. the pretty boys get to be the knights obviously. 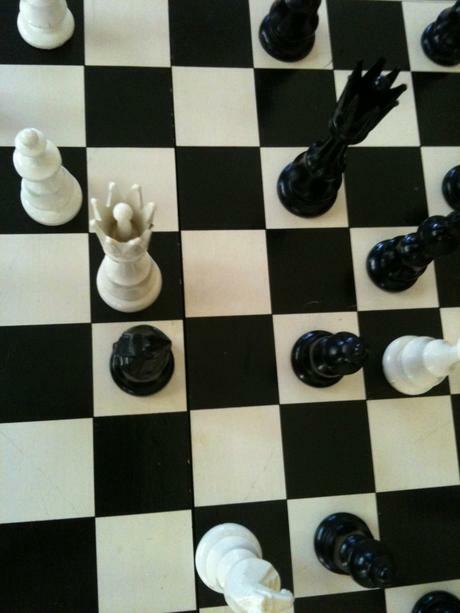 so on it goes and the rest are pawns. now placing the pieces is another matter of finesse and delicate understanding of everyones latest and greatest. the gossip, the drama and the absolutely nots. it all contributes to what could only be a memorable evening. mind you, memorable for the right reasons. my worst party ends abruptly with one of the guests looking for her broken tooth under the piano after making an overly ambitious late night dance step. the scramble for ice, the panic. the last thing you need when you’re trying to serve coffee and friandise. accidents happen, you say. ha. the host can sidestep checkmate and still prevent calling the ambulance. i’ll have to do a piece on parties and events first aid. i’m sure colin cowie knows what i’m talking about. 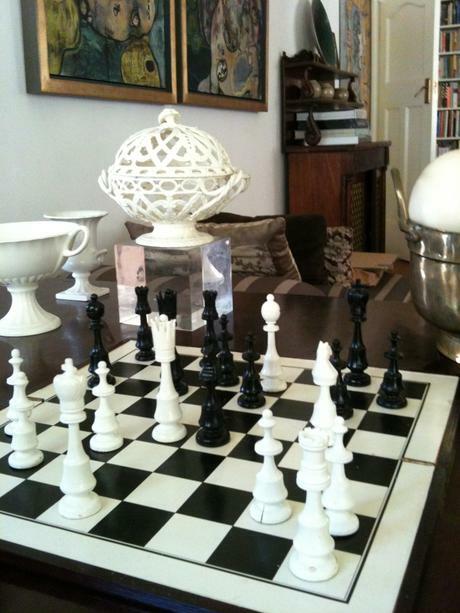 so talking about not knowing where the pieces are, back to the chessboard. i’ve recently taken to playing against a blind cousin of my wife’s. quite an educational experience. we’re talking about someone that cant see what she eats. when seated next to her at some family lunch or other, one is obliged to call out: peas-at-five-o’clock, chicken-at-three-o’clock and potatoes-at-quarter-to-six. or whatever. now this got me interested in the notations. the archaic to the modern. Kings-knight-three-to-Kings-rook-two etc. quite elegant and one almost feels like donning a paisley gown and having a brandy when you say it. it reminded me of (yes, i’m a romantic) of all those pictures i saw as a child of men playing chess in the luxembourg gardens and of scenes from bladerunner. still one of my all time favourite movies. so on with the game. after beating both my son of six and the blind cousin, i’m not entirely sure if i would call myself a champion. what i can say however, is that it makes for a refreshing change to scrabble and more success at dinner party arrangements.